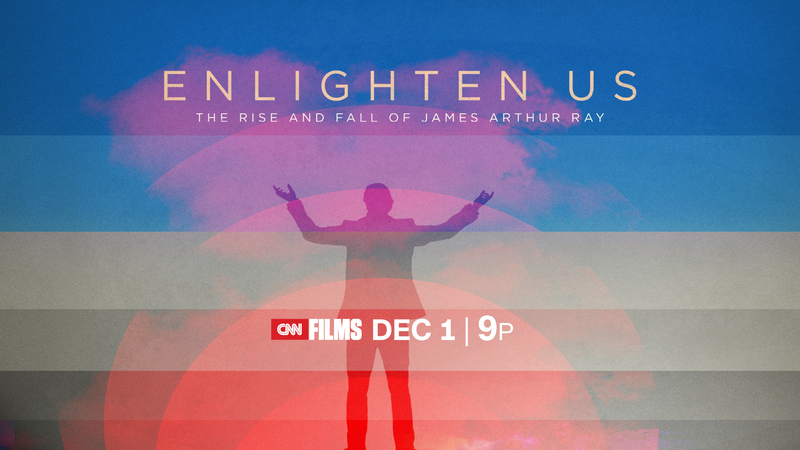 ENLIGHTEN US: The Rise and Fall of James Arthur Ray, directed by Jenny Carchman, will premiere Thursday, Dec. 01 at 9:00pm and 11:00pm Eastern on CNN/U.S., with limited commercial interruption, the network announced today. ENLIGHTEN US made its world debut at the 2016 Tribeca Film Festival in New York City in April and also screened at Telluride Mountainfilm in Colorado and Tallgrass Film Festival in Kansas. The film explores the story of the motivational speaker’s meteoric rise, fall, and attempt to return to the $11 billion personal growth industry following his conviction for negligent homicide in the deaths of three of Ray’s clients at one of his events. The film explores the origins of the self-help industry, what followers of the industry are looking for, who is offering answers to those followers, and why some are willing to risk so much for that guidance. “Jenny Carchman’s thoughtful film brings viewers inside an industry we may recognize, but not fully understand in terms of the multifaceted and complex risks for some devotees. This film invites reflection and conversation about the broad questions of meaning and fulfillment, but also about how we seek answers to those questions,” said Amy Entelis, executive vice president of talent and content development for CNN Worldwide. Ray toiled for years giving motivational speeches and leading personal growth seminars before a career-changing appearance in the 2006 film, THE SECRET. Instant fame led to sudden growth in his clientele. Book and television offers followed as more and more people sought out Ray’s seminars. As his story unfolds in ENLIGHTEN US, viewers learn from Ray, his followers and his accusers, about how some methods of self-improvement ultimately led to so much suffering. The film will also stream via CNNgo (www.CNN.com/go and via CNNgo apps for AppleTV, Roku, Amazon Fire, and iPad) and will also be available after the premiere (Friday, Dec. 02) on demand via CNNgo and cable/satellite systems. ENLIGHTEN US will encore on CNN/U.S. on Saturday, Dec. 03 at 8:00pm and Sunday, Dec. 04 at 12:00am Eastern. Digitally, CNN will develop a photo gallery of the names and faces of the top in-demand motivational speakers in the self-help industry, as well as a look at the industry’s practices, and a timeline of events at James Ray’s retreat in Sedona. These multimedia materials, and excerpts from the film, will be available via CNN’s mobile platforms and www.CNN.com/EnlightenUs closer to the time of the broadcast premiere. ENLIGHTEN US is produced by Allyson Luchak, and executive produced by Julie Goldman, Christopher Clements, Amy Entelis, and Vinnie Malhotra. Distribution for ENLIGHTEN US is negotiated by Josh Braun, co-president of Submarine, on behalf of the filmmakers. CNN Films produces and acquires documentary feature and short films for theatrical and festival exhibition and distribution across CNN’s multiple platforms. Amy Entelis, executive vice president of talent and content development, oversees the strategy for CNN Films; Courtney Sexton, vice president for content development, works day-to-day with filmmakers to oversee projects. For more information about CNN Films, please visit www.CNN.com/CNNFilms and follow @CNNFilms via Twitter.